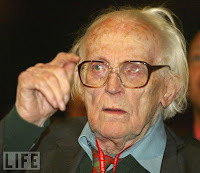 Michael Foot, former Labour leader has died at the age of 96. It is a shame really. We could have done with him as leader of the Labour Party today. At least there would be no pretense about their intentions. Thank Foot, by the way, for the Health and Safety at Work Act, so beloved of those who refuse to save drowning kids from canals. I saw him once at a do. He had been invited by a much younger lady, who I knew reasonably well. who made no secret of her "attachment". He was in fact a known shagger, but the press never spilled the beans while he was in politics. Odd really. 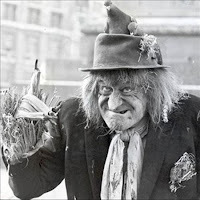 He looked like Worzel Gummidge. Perhaps there is hope for me. He had a wonderfully sharp wit and shone in the 1979 no-confidence debate. But, greatly, fatally, overshadowing that is his opposition to rearmmament in the 1930s, also opposed by the unions, also opposed by Stalin.I doubt if Hitler supported it either. mind you. A refreshingly honest holiday from today's BBC, wall-to-wall, revisionist treacle about this bizarre character.